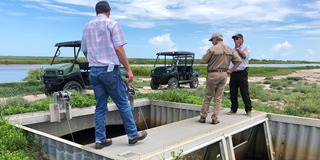 DU designed and replaced a water-control structure and repaired a levee that were damaged by hurricanes on the Texas Chenier Plain. For generations, the Trull Foundation has worked hard to protect and enhance natural habitats along the Texas coast, especially in Matagorda County. Located in Palacios, the Trull Foundation funds environmental conservation and supports the values of responsible land stewardship, even if the land is used for commercial purposes such as farming. The Trull Foundation has been supporting DU’s conservation efforts since 1991. The foundation’s gifts support DU’s Gulf Coast Initiative, which enables DU to conduct important science, public policy, and outreach efforts, as well as conserve habitats that are important to waterfowl wintering on the coast. The Gulf Coast of Texas and Louisiana contains one of the highest concentrations of wintering waterfowl in the United States. Such large populations of waterfowl, other waterbirds, and shorebirds make this landscape a top-priority conservation area for DU. Additionally, protecting coastal marsh habitat for wildlife buffers Texas communities from storm surges. The Trull Foundation has worked with DU and other partners to conserve coastal wetlands for blue-winged teal and other waterfowl. From attending meetings with key stakeholders to preparing public or private grant requests, funding from foundations like Trull allows DU to partner with other organizations, private individuals, and public agencies to make sure that the maximum on-the-ground impact is achieved for waterfowl, wetlands, and the people that enjoy them. To date, the Trull Foundation has donated over $191,000 to protect and enhance Texas habitats. DU is truly thankful for the foundation’s long-term support and investment in our conservation work on the Texas coast.